Downes Swimming Pool Company designs, builds, restores, and maintains quality, in-ground Gunite (concrete) swimming pools in northern Illinois and nearby states. Downes has won 150+ Regional, 300+ Midwest, and 18 International industry awards – an unparalleled accomplishment in our geographic area. More important to us, our customers appreciate our work and dependability, and have rewarded us with over 95% maintenance renewal rates. We are experts in automatic cover pools, free form pools, indoor pools, vanishing edge pools, concrete spas, and a variety of water features, and we are obsessed with service, pool restoration, and long customer relationships. We build pools to last. And we always design so that your pool is an integrated part of your home and landscape. We want you to use and enjoy your indoor or outdoor pool and/or spa for many uninterrupted years to come. We hope you will design, build, and maintain with Downes; "You will always be glad you did." Please ask us for our many hundreds of references who are not only repeat customers, but champions of and advocates for Downes Swimming Pools. I design awesome Pools, Spas and Water Features for your family's health and enjoyment. Sunset Pools and Spas, Inc. is a family owned and operated business serving the Chicago-land Area. Our goal is to give customers superior service by providing a personalized hands-on approach. We specialize in concrete swimming pool construction, fireplaces, patios, outdoor kitchens and more! We also provide maintenance and repair services. At J.F.Y., we are focused on providing custom pool services with the highest levels of customer satisfaction – we will do everything we can to meet your expectations. With many years in the pool industry, we’re sure you’ll be happy working with us. Look around our website and if you have any comments or questions, please feel free to contact us. We hope to see you again! Check back later for new updates to our website. There’s much more to come! 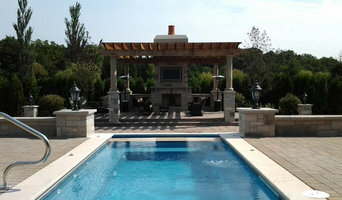 Barrington Pools' design and construction process provides outdoor living possibilities customized to clients' needs. For homeowners that need the best quality and technology in swimming pools, spas, patios, and landscapes, Barrington Pools offers turn-key design and construction services that are supported after installation by maintenance plans. Our award-winning designs are recognized nationally, but our customers, who frequently refer others, are our best advertisement. The team at Barrington Pools will work with you to design and plan your luxury poolscape. From your first sales call to the opening of your swimming pool, our team members will demonstrate to you world-class customer service and support that our clients expect and deserve. All aspects of the project are performed by Barrington Pools employees to ensure control and accountability. During our more than 40 years in business, we have installed over 6,000 pools. We understand the engineering behind our pools and pool systems. The confidence we have in our engineering allows us to offer a 20 year warranty. Lifestyle Concepts, Inc. has been designing, building and maintaining pools and spas in northern Illinois for nearly 40 years. We are a family owned and operated company, serving our customers with the same courtesy, quality and respect we would serve our own family members. We offer a commitment to excellence that is rare these days. We do this by owning the entire process from the very beginning of the design all the way through to the first time you dive in to your new pool. We've made it a rule for ourselves that at least one of the principles of the company is on site for each and every project. This means that you have access to us throughout the design, build and installation process. If changes need to be made, the right person is on site to make that happen for you. 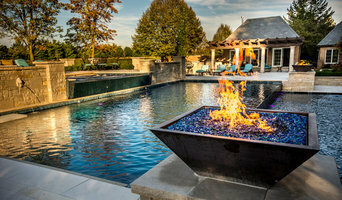 Voted as one of the top 50 pool builders in the country in 2013, 2014, 2015, 2016, 2017, 2018 and 2019, All Seasons Pools & Spas, Inc. is an award winning in ground pool, spa, outdoor living and backyard designs and construction company. We specialize in working with our clients to produce complete backyards that will help them to create memories full of great times with family and friends. At Caribbean Pools, Inc., our goal is simple: to transform your backyard into a uniquely personal retreat that will refresh your spirit, renew your relationships, and revive your playful side. It's a goal we have been honored to meet for over 40 years. Have a vacation in your backyard, a wonderful time for you and your whole family. Inground pools are a great way to have family fun together. We started in 1971 as a small, one-man company selling pool supplies door-to-door south of Chicago. Today, over forty years later, our modest one-man business has grown into the largest home leisure retailer in the Midwest. Over the years, we've remained a family-run business, and that's something we're very proud of. In fact, the same folks who once walked door-to-door in our early years are the same ones who own and operate our Great Escape stores today. Over the past four decades, we've been able to satisfy thousands of loyal customers by offering our quality products at the lowest possible prices. We're also firmly dedicated to providing each one of our customers with truly responsive and knowledgeable service. If you're already a Great Escape customer, we'd like to thank you. If you haven't yet been to one of our stores, we invite you to discover The Great Escape difference today. Scott Pools LLC, your premier swimming pool company throughout the Fox Valley area. We are a professional pool builder and service company with over 25 years of experience. Scott Pools is devoted to, dedication, integrity, and a commitment to exceeding the expectations of our customers. We add the water you make the memories. What exactly do St John pool builders do? If you are planning for a new pool in St John, IN, a swimming pool builder will analyze your outdoor space and your aesthetic wishes to determine an appropriate design for your yard, installing it once the plan is developed and approved. Once installed, some pool companies in St John, IN can handle the necessary cleanings, water testing, renovations and equipment replacement or repairs for your pool or spa. If not, many can also suggest St John, IN swimming pool contractors or maintenance services to help with upkeep or repairs down the road. Here are some related professionals and vendors to complement the work of swimming pool builders: Garden & Landscape Supplies, Landscape Architects & Landscape Designers, General Contractors, Landscape Contractors, Solar Energy Contractors. Before hiring a swimming pool construction company to create your new St John, IN pool, determine how you'll be using it. Will it be for fun or for lap exercise? Will the primary users be children, adults or a mix of the two? Knowing the use can help you find St John pool builders who shares your aesthetic. Once you find swimming pool builders in St John, IN who share your style, research is critical. Review customer references and comments, collect at least three to four estimates to compare, meet with potential St John pool designers and builders in person and ensure that they are Indiana certified service professionals and licensed with the registrar of contractors before making any final decisions. In addition, get a sense whether they plan to complete the pool installation and be done with it, or whether they seem interested in building a long-term relationship with you. Be wary of the former: it's likely a reflection on the level of quality of the pool construction they do. Find a St John pool contractor or designer on Houzz. Narrow your search in the Professionals section of the website to pool builders in St John, IN. You can also look through St John, IN photos by style to find a pool or spa you like, then contact the local pool company who designed it.